But in the past couple of years, those of us who work online from home and cafes have seen a noticeable increase in tools designed to help us make the most of our freelance lives. Some of them have become quite famous in the freelance world, but that doesn’t mean that there isn’t room for a scrappy startup or two that wants to make our lives easier. The latest such startup to cross my virtual desk is Table, which touts itself as a combination of a collaboration and project management tool. Users can not only collaborate with their existing teams via their multimedia team chat app but can also network with other users that they haven’t met yet. Let’s take on one feature at time though, shall we? 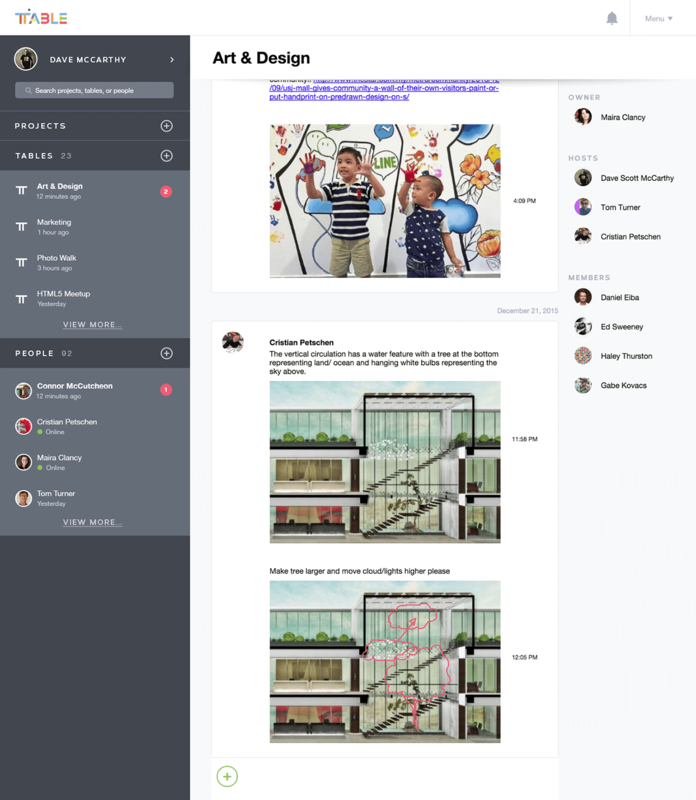 The team collaboration app lets users create both private and public spaces (called “Tables”) in order to coordinate their projects, host different groups, post opportunities – either in their own companies or ones to share – get tasks done, and chat. Users can send images or files within the app, or even just doodle. When it comes to connecting with new people, Table has set it up so that users can create a full-screen profile in order to not only introduce themselves to the community but also show off their work. Unlike the clunky profiles on a certain other popular professional networking site (ahem), the profiles on Table are lovely, intuitive, and designed specifically with creatives in mind. The profiles are also a space where users can monitor postings they care about, whether it’s stuff going on in existing teams, groups, conversation, or partnerships or opportunities that they’re interested in exploring. Table is also specifically set up so that users can find the best fit for their next collaborative project. Search collaborators by skill set, availability, location, or just by browsing through the in-app Projects feed. As any freelancer knows, networking is one of the most important ways to stay ahead in your chosen field. Table provides multiple ways for you to do just that!